ICSR is the premier international conference in the ?eld of software reuse. 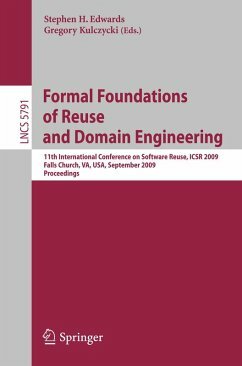 The main goal of ICSR is to present the advances and improvements within the software reuse domain, as well as to promote interaction between researchers and practitioners. The 11th International Conference on Software Reuse (ICSR 2009) was held during September 27–30, 2009 in Falls Church, VA, USA. 2009 was the year that ICSR went back to its roots. The theme was “Formal Foundations of Reuse and Domain Engineering.” We explored the theory and formal foundations that underlie current reuse and domain engineering practice and looked at current advancements to get an idea of where the ?eld of reuse was headed. Manyof the papers in these proceedings directly re?ect that theme. The following workshops were held in conjunction with ICSR 2009: – Second Workshop on Knowledge Reuse (KREUSE 2009) – RESOLVE 2009: Software Veri?cation – the Cornerstone of Reuse – First International Workshop on Software Ecosystems – International Workshop on Software Reuse and Safety (RESAFE 2009) Aside from these workshops and the papers found here, the conference also included ?ve tutorials, eight tool demos, and a doctoral symposium. Links to all of this information and more can be found at the ICSR 11 conference website at icsr11.isase.org. Component Reuse and Verification.- Consistency Checking for Component Reuse in Open Systems.- Generating Verified Java Components through RESOLVE.- Increasing Reuse in Component Models through Genericity.- Verifying Component-Based Software: Deep Mathematics or Simple Bookkeeping?.- Feature Modeling.- Extending FeatuRSEB with Concepts from Systems Engineering.- Features Need Stories.- An Optimization Strategy to Feature Models' Verification by Eliminating Verification-Irrelevant Features and Constraints.- Reusable Model-Based Testing.- Generators and Model-Driven Development.- A Case Study of Using Domain Engineering for the Conflation Algorithms Domain.- Model Transformation Using Graph Transactions.- Refactoring Feature Modules.- Variability in Automation System Models.- Industry Experience.- A Case Study of Variation Mechanism in an Industrial Product Line.- Experience Report on Using a Domain Model-Based Extractive Approach to Software Product Line Asset Development.- Reuse with Software Components - A Survey of Industrial State of Practice.- Product Lines.- Evaluating the Reusability of Product-Line Software Fault Tree Analysis Assets for a Safety-Critical System.- Feature-Driven and Incremental Variability Generalization in Software Product Line.- Identifying Issues and Concerns in Software Reuse in Software Product Lines.- Reuse of Architectural Knowledge in SPL Development.- Reuse and Patterns.- Introducing Motivations in Design Pattern Representation.- The Managed Adapter Pattern: Facilitating Glue Code Generation for Component Reuse.- Reusing Patterns through Design Refinement.- Service-Oriented Environments.- Building Service-Oriented User Agents Using a Software Product Line Approach.- DAREonline: A Web-Based Domain Engineering Tool.- Extending a Software Component Repository to Provide Services.- A Negotiation Framework for Service-Oriented Product Line Development.- Ranking and Selecting Services.- A Reusable Model for Data-Centric Web Services.